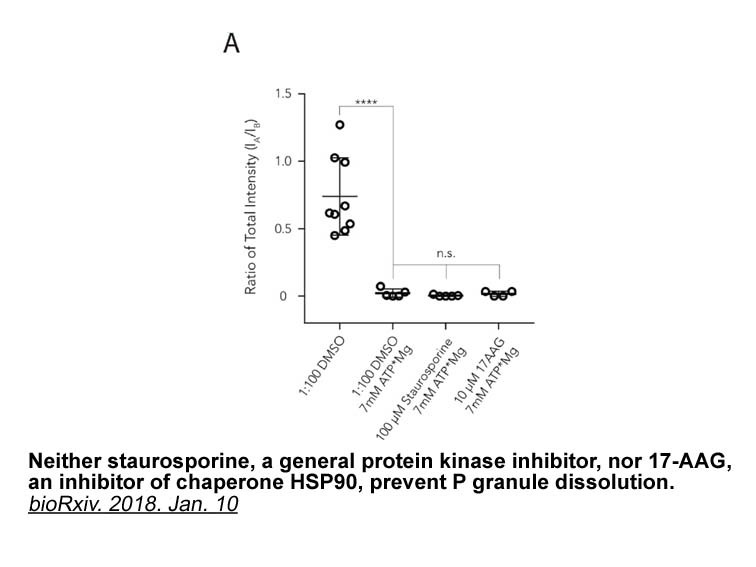 Description 17-AAG (Tanespimycin) is a potent inhibitor of HSP90 with IC50 of 5 nM. 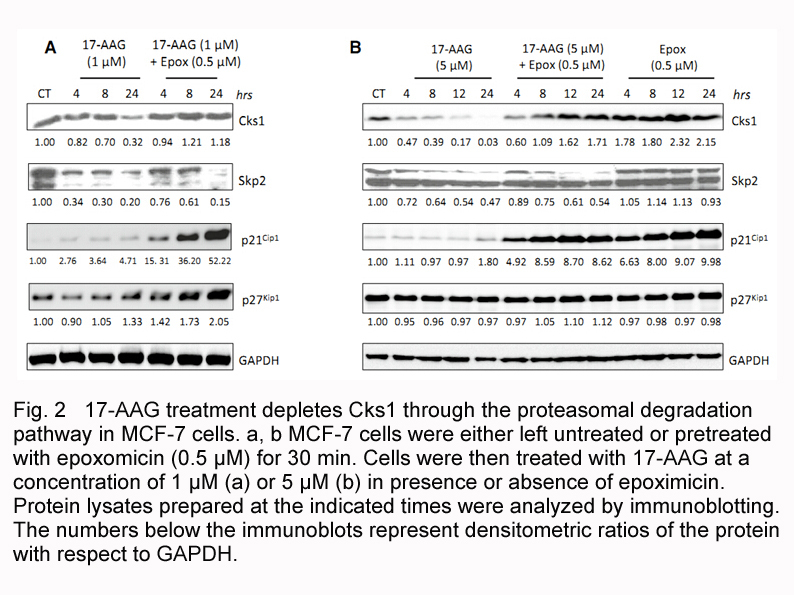 The cells were treated with a range of 17-AAG concentrations for 24 h and then cultured in the absence of 17-AAG for an additional 48 h. 17-AAG showed antitumor activity in these four human colon adenocarcinoma cell lines and reduced cell viabilities dose-dependently. The IC50 values for HT29, HCT116, KM12 and HCT15 cells are 0.2, 0.8, 0.9 and 46 μM, respectively. Both continuous and intermittent dosing schedules were studied. The “continuous” dosing schedule involved exposure to drug 5 days/week for 3 consecutive weeks. In the “intermittent” schedule, mice were treated with one 5-day cycle and then monitored for tumor progression. At progression, mice were treated with a second 5-day cycle of drug. Both regimens caused a dose-dependent delay in xenograft tumor growth in all three models. 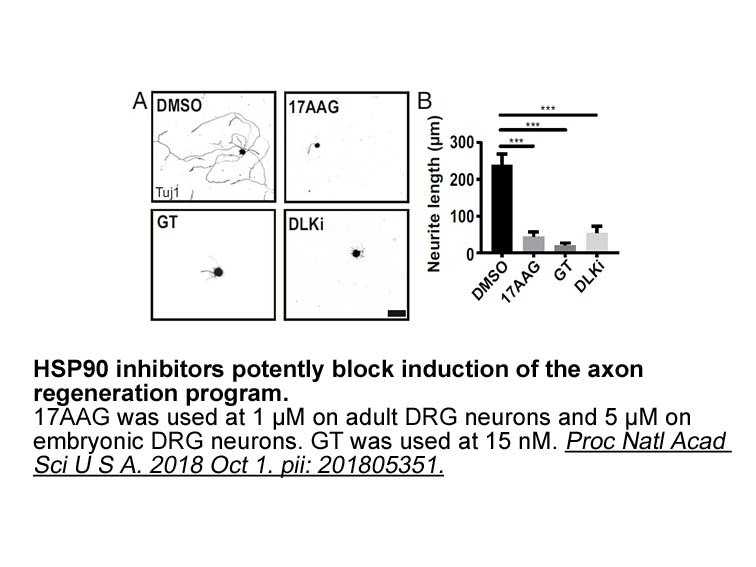 With the continuous schedule, 50 mg/kg 17-AAG caused 80% growth inhibition of CWRSA6 tumor growth when assessed on the day the controls required sacrifice. 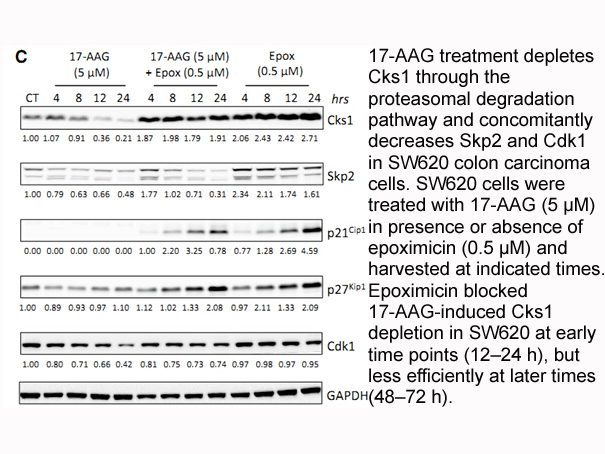 With the intermittent schedule, 17-AAG caused 87% growth inhibition of CWRSA6 tumor growth. Similar results were noted with the parental CWR22 model and with a second androgen-independent subline CWR22R. 17-AAG is a potent inhibitor of HSP90 with IC50 value of 6 nM in BT474 cells . 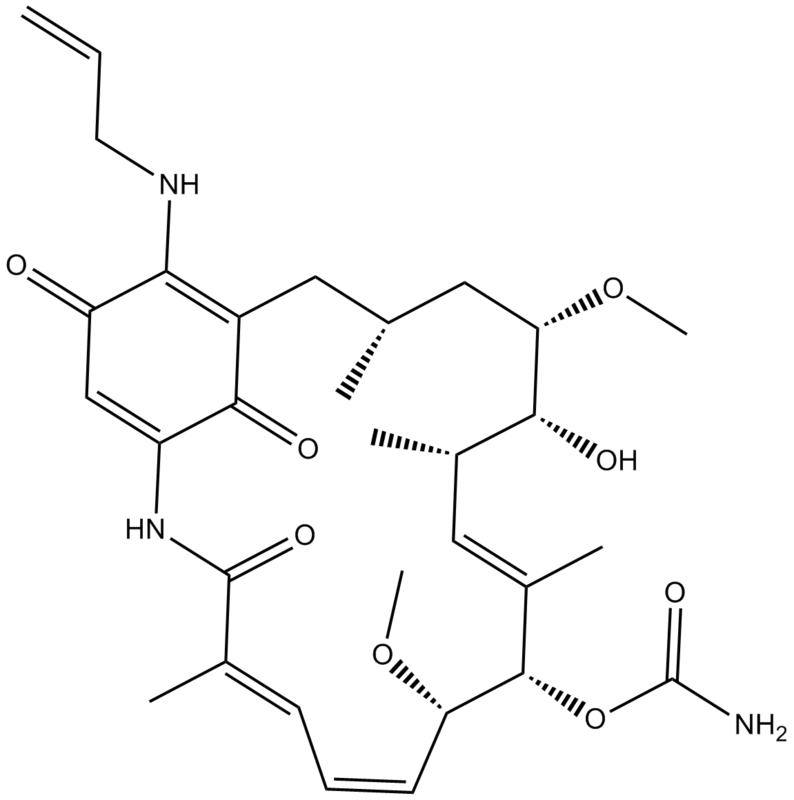 17-AAG is a synthetic analogue developed from geldanamycin which was found to have significant hepatic toxicity. 17-AAG has an improved toxicity profile and has no hepatic toxicity. 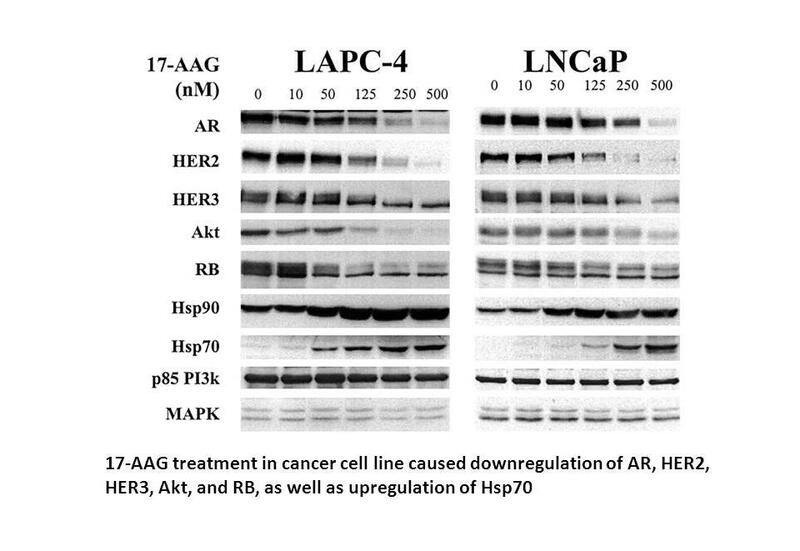 17-AAG can bind to HSP90 and destabilize the client proteins such as HER2, Raf-1, p53 and MAPK signaling. 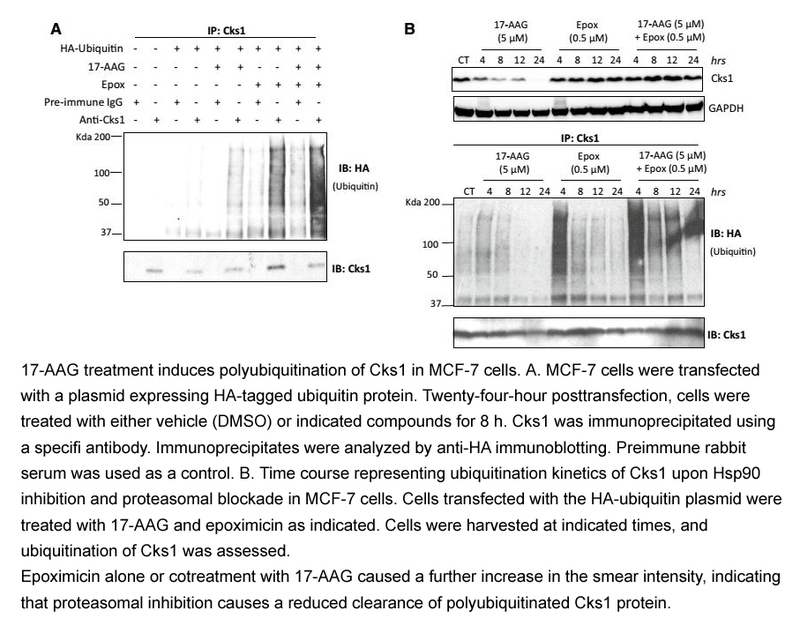 In Multiple myeloma (MM) cells, 17-AAG treatment inhibited cell proliferation and survival. 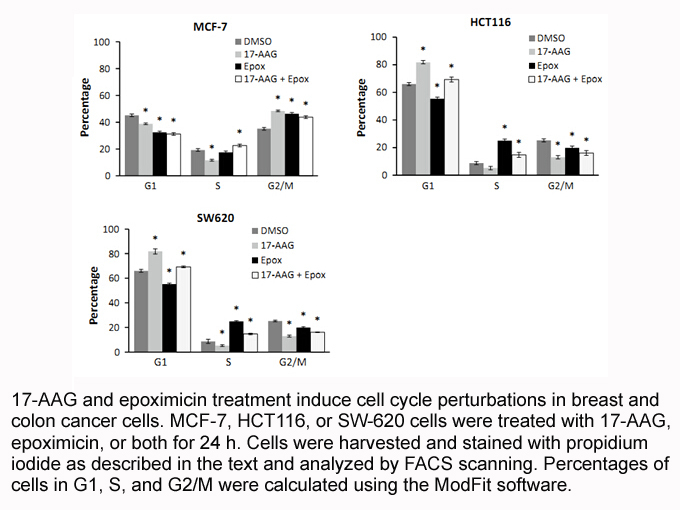 The combination treatment of 17-AAG and bortezomib induced apoptosis in primary MM cells resistant to doxorubicin and bortezomib. The combination of 17-AAG and trastuzumab reduced the expression of ErbB2 in breast cancer cells overexpressing ErbB2. 17-AAG also showed efficacy in thyroid cancer cells and Hodgkin lymphoma cells. Besides that, 17-AAG was found to increased apoptosis in human melanoma xenografts. 17-AAG is now in phase II clinical studies . Kamal A, Thao L, Sensintaffar J, et al. A high-affinity conformation of Hsp90 confers tumour selectivity on Hsp90 inhibitors[J]. Nature, 2003, 425(6956): 407-410..